Is there a more timeless window treatment than horizontal blinds? Always in-style, and always functional, horizontal blinds provide the perfect solution for light control and privacy in any home or office. To provide our customers with the widest range of selection, we offer wood blinds, faux wood blinds, and aluminum blinds in a wide array of colors and slat sizes. Custom wood blinds are available in a variety of paint and stain colors, and slat sizes. Slat sizes include 1", 2", and 2-1/2". Our custom faux wood blind collection also offers color and slat size variety. The collection features 2" and 2-1/2" slat sizes and nearly 50 different color options. In addition to wood and faux wood blinds, we also offer 1" and 2" aluminum blinds. During your consultation we will have samples of the various styles of horizontal blinds in all the colors available. With so many options to choose from our team of experts will help you to select the product that best meets your needs, and best matches your interior design. Horizontal blinds are one of the most versatile window treatments in regards to privacy and light control. This is due to the ability to control the lift and the tilt of the blinds independently. Tilting the horizontal blinds to certain angles can allow for light to flow in to a room without allowing outsiders to see in. 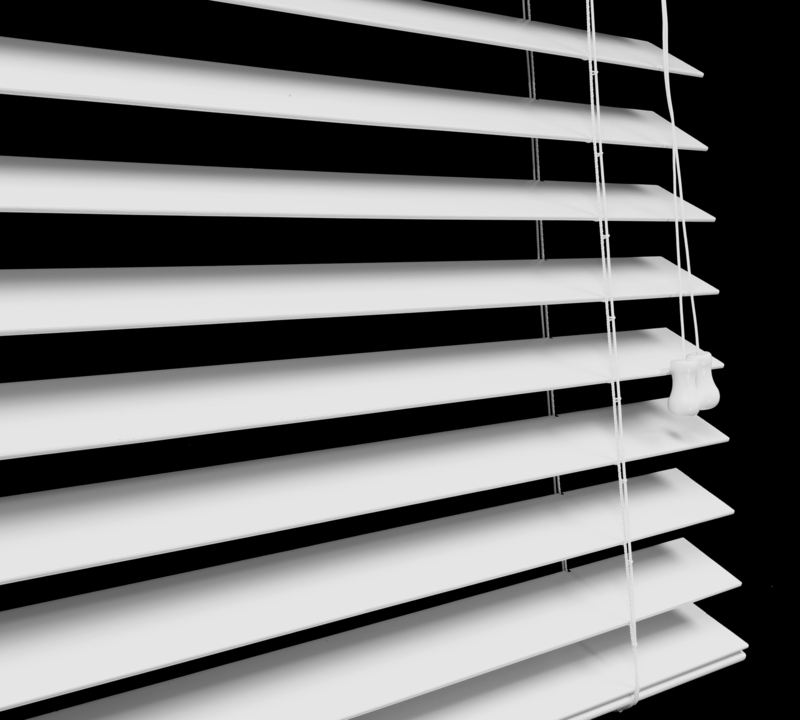 Closing the venetian blinds entirely allows privacy and light control. There are routeless and decorative tape ladder options that will enhance the light and privacy controls. Want to enjoy the view? Either lift the blinds or tilt them to the open position. Doing so will still provide a degree of light control, while increasing the ability to view out. Horizontal blinds are perfect for windows, arches, and French doors. Horizontal blinds are available in a wide array of color options. Control Options: Horizontal blinds come standard with both lift and tilt cords. Tilt cords can be replaced by a wand, but lift cords will come standard on all horizontal blinds. Decorative Tapes: Horizontal blinds will have route holes. These route holes will allow small amounts of light to come into the room. For select products, decorative cloth tapes are available to cover route holes, while providing an elegant, refined look in the process. Privacy Blinds: In contrast to the above, horizontal blinds don't have to have route holes. Visions™ routeless option offers no route holes. Cords run through notches at the back of the slats and are hidden when the blind is closed eliminating light gaps and peep holes caused by route holes. Wide Windows: Like any other product, horizontal blinds have certain width restrictions. Our width restrictions for one horizontal blind range from 6 feet to 12 feet. For wider windows, multiple blinds can be fabricated on one headrail, making it possible to cover windows that exceed the width restrictions. Motorization: For maximum convenience and control, we offer motorization on select wood, faux wood, and aluminum horizontal blinds. Motorization options include battery, DC, or solar power as well as a variety of control options (wall switches, multi-channel remotes, and even smartphone control).